The Consulate District of Nanning, the capital of China's Guangxi Zhuang autonomous region, provides a place where the city can increase cooperation with members of the Association of Southeast Asian Nations (ASEAN). Work on the 8.7-hectare district has been underway since 2005 and it has become an important part of the Nanning China-ASEAN Business Area. So far, Vietnam, Thailand, Cambodia, Laos, and Myanmar have set up consulates there and the consul generals of these ASEAN countries agreed to share their views on the development of Nanning with China Daily. Since coming to Nanning in April of last year, Phonekham Inthaboualy, the consul general for Laos, has made a great effort to increase trade, economic, cultural, tourism cooperation with the Guangxi region. "When I came here for the first time, I found Nanning to be a beautiful city with lots of greenery, and the city services and facilities worked very well. I've been to many cities, but it's only in Nanning where I feel quite at home," he told China Daily. "I enjoyed the Spring Festival and traditional Zhuang folk festivals here with their grand ceremonies, full of national characteristics. "The people of Nanning are also friendly and its exquisite environment makes Nanning a wonderful city at all times." Karoon Lirdluckanawong, Thailand's deputy consul general, who has worked in Nanning since May 2010, described the city as quiet, pleasantly cool, and livable". "I was a bit worried about my life in Nanning before I came, but now I like the city very much, especially its wonderful climate and delicious foods," he said, explaining, that the urban area has grown rapidly, with many great results. One example he cited was the annual China-ASEAN Expo, which has its permanent site in Nanning and allows enterprises to participate in a variety of economic and trade activities and matches businesses. "I think the China-ASEAN Expo is a good place for the Thai people to learn about Nanning and they have acquired more information. You can now see lots of Thai fruits in Nanning, and some Nanning fruit has become a favorite in Thailand." Karoon attended the Buluotuo Cultural Festival in a county near Guangxi and found similarities in the language and lifestyle of the Zhuang ethnic group and those of Thailand. "I am now doing some research on the Buluotuo culture to promote cultural exchanges with Thailand." 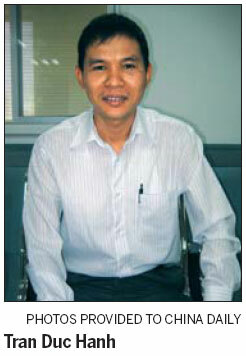 U Kyaw Swar Oo, Myanmar's deputy consul general in Nanning, said that he also enjoys life in Nanning. "I think Nanning is becoming better and is a modern, international city, suitable for living." Myanmar was the fifth ASEAN country to open a consulate-general in Guangxi. "Because of the China-ASEAN Expo, I had already learned about Nanning before coming here. The clean streets, the spring-like seasons and the comfortable environment also attracted me." In his free time, U Kyaw Swar Oo often takes a walk in the Qing Xiushan Forest Park, which is "a great place for relaxing, also a good place for me to pray at the temple there". "The most unforgettable memory I have of Nanning is the founding of our consulate-general. I really have a serious responsibility here." Keo Thoeum, Cambodia's consul in Nanning, explained, "Nanning is the capital of the Guangxi Zhuang region and the heart of Guangxi and I think it has huge development potential and prospects. "I feel comfortable in Nanning, with its advanced leisure facilities, wide roads, and more tall buildings here." Tran Duc Hanh, Vietnam's consul, has a similar view of the city's development and said that he can hardly believe Nanning has developed so well and that everything is as good as it is.